Scenic places and romantic names are the stuff of Skye. The Misty Isle of melancholy moods and sombre stories. In the heart of the island, the road to Elgol follows a wide, sedate valley between hills that seem to kneel in homage to the great ridge of the Cuillins up ahead. Behind these hills on the south side lie two abandoned villages, Boreraig and Suisnish. Abandoned is the wrong word. Though it feels right when you’re there. 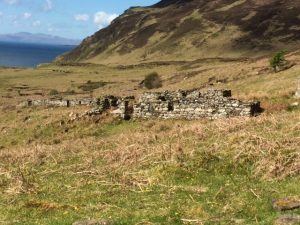 These settlements were ‘cleared’ in 1853 by Lord MacDonald to make way for sheep, as was the way with clearances. The guide books tell you the clearance was brutal. Most were. So probably it was; people would hardly leave their homes willingly when they had nowhere to go and faced an unthinkably uncertain future, displaced from all they knew. The two communities are about 3km apart. A 10-mile circuit takes to you to both. 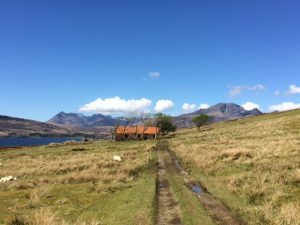 In all my walking on Skye, I’d never done it – until last Saturday when I did it in the sunshine. I had visited Suisnish a couple of times, walking there and back from a different start point. What’s left of Suisnish is scattered; collapsed walls of houses overgrown with grass and weeds, bracken and brambles. I couldn’t bring to mind a sense of the place. It was a collection of old stones in structures loosened by time and eroded by nature and weather. An old shepherd’s hut still stands, its tin roof must have been added much more recently. It creates a strong focal point with its backdrop of mountains that take your breath away. But it doesn’t resonate anymore with the songs, the prayers or the curses of the last shepherd. So, I set out for Boreraig with low expectations but in need of fresh air and a strenuous workout. The trail starts from the ruined church of Kilchrist and heads up over the moor for about 3.5 km. The moorland is thickly covered with heather and sections are wet and boggy, but the stone path is well-trodden and easy to follow. At the top of the moor you look down towards Loch Eishort, a sea loch that gives out into the Cuillin Sound, the stretch of water between Skye and Rum. Boreraig lies on Eishort’s shore. I walk down to the village and am instantly bewitched. Here you can call something of the past to mind. A community hard by the sea on a glorious stretch of grassy coastal glen, sheltered by mountains and moors and with easy access to gentle waters. Houses lie ruined but somehow not wrecked. Some of the life they contained seems to linger still. Generously proportioned and built of stones of such even sizes, it’s if a master mason had been at work; some have survived up to the door lintel. You can imagine children down by the shore, catching crabs at the edge, playing hide and seek, paddling up by that beach yonder, the one with the dark, slate-coloured sand. I know, I know. But it’s hard to resist a romantic idyll. The children are gone; their parents and grandparents with them; the mason too. The sheep remain with their new lambs. A little anxious today; an intruder walks among them. What I don’t get is why, in a place like this, it wasn’t possible to have the people AND the sheep. Why did the families have to be forced out? How many sheep could you graze here and why not keep some of the community to work the sheep and let them cultivate some land in exchange? There’s good grazing here, but limited. I counted about 30-40 sheep including the lambs; you’d struggle to have more with the dense moor close by on the hillside. What was Lord MacDonald’s business case? One wonders: did social engineering lurk in among the economics? What happened to the people? 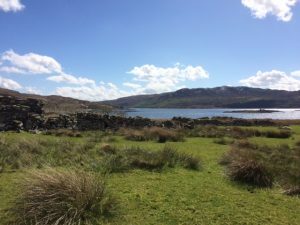 Of the 22 families estimated to be living here at the time of the clearances, some went to Australia courtesy of the Highland and Island Emigration Scheme (sounds alarmingly contemporary). Around 7 families stayed on Skye, homeless, their world disrupted, scratching a living but hardly finding a life. Such echoes – today’s tunes played in yesterday’s key. There are other clearance villages on Skye – Lorgill, for example, further north. None are as entrancing as Boreraig. Life wasn’t an idyll; it was probably, as Hobbes would say, nasty, brutish and short. But Boreraig retains a solemn beauty; its quiet, hidden tranquillity shouts out the awful reality of power and the shameful injustice of powerlessness. wow, so powerful and evocative; and what a contrast between the beauty evident from the writing and photos and the horrific history. I only hope that the islanders who immigrated to Australia, like my ancestors from the Shetlands, (in less dire circumstances, but at the same time) fared as well as our family. Thanks Liz. What a moving post, Liz. I know what you mean about the ghosts lingering in some of those deserted Highland villages. And what a beautiful day you had!!! What a moving piece, Liz. I know exactly what you mean about ghosts in those clearance villages.